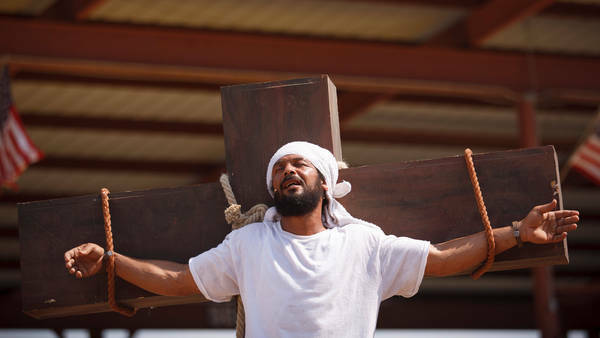 Prison Passion Play: Inmates, many of them serving life sentences, put on “The Life of Jesus Christ,” a passion play chronicling the biblical story on the grounds of the Louisiana State Prison at Angola. ANGOLA, La. — On a December night in 1991, the man who would later play Jesus committed a string of armed robberies in New Orleans. Ten years later, the woman who would play the Virgin Mary robbed a Mexican restaurant across town. A month after that, a teenager killed his girlfriend and infant daughter. He would go on to play Joseph. “The Life of Jesus Christ” — a three-and-a-half-hour play with a cast of 70, plus a mule, two horses, a lamb and a camel — made its debut this weekend in a three-day run at the Louisiana State Penitentiary. The production featured men from Angola and women from the Louisiana Correctional Institute for Women, who traveled an hour and 40 minutes by bus each morning from St. Gabriel to this 18,000-acre prison farm on the Mississippi River. Much of the cast was in rehearsal on and off for two years. That is a long time by many standards, but not by the standards of Angola. The average sentence at the state penitentiary is 93 years. Of the 5,329 men in prison, over 4,000 are serving life without parole. Less than two hundred are expected to ever leave. Beyond Angola’s staggeringly high number of lifers, there is much that is distinctive about it, including a twice-yearly inmate rodeo that is open to the public. But “The Life of Jesus Christ,” which was performed in the rodeo pit before a reactive audience of inmates, relatives, church groups and ticket buyers, is not quite like anything that has come before. It is a fully costumed and staged theatrical production with musical interludes. It is also the first time that so many male inmates have worked for so long with so many women, who said they had difficulty getting used to the fact that they were allowed to touch the men. The sets, made of found material like PVC pipe and bicycle tires, were designed by Peter Rubens, a building contractor and artist who has sculptured statues for neo-Classical casino lobbies and enjoys painting in the style of the old masters. He shot a former employee in 2008. The play was directed by a man named Gary Tyler, who has been here for 38 years. He is not unknown to the outside world. Mr. Tyler was convicted of murder in 1974 — a mob of angry whites attacked a bus full of black students; a young white boy was shot dead. Mr. Tyler, who was 16 at the time and on the bus, was charged with killing him. At the time he was the youngest prisoner on death row (a sentence later changed to life). A federal appeals court found that his trial was “fundamentally unfair” but for procedural reasons did not allow for a new trial. Calls for his release have never ceased. Mr. Tyler, who has long run the drama club here, does not talk about the circumstances that brought him to Angola. He will talk about the themes of the play. A spiritual but not particularly religious man, Mr. Tyler recounted the instructions he gave to the cast — which he picked himself — especially the Muslims and nonbelievers, and the male actors who were reluctant to play a snitch like Judas. You were acting a role when you were on the streets, he told them, and you were judged based on someone you were not. Use the same energy behind that deception for the role, one that you can control. Levelle Tolliver, a talented actor who shot a man in the head in 1993 and now plays Judas, talked about his character’s unbearable burden of guilt. Jimmie Patterson, who plays Pontius Pilate, discussed the degree to which his character, whom he compared to a judge, was blameworthy for sentencing an innocent man to death. Sandra Starr says she understands her character, Mary Magdalene, because she, too, has been used by men. Such resonances are not played down by prison officials. Scenes from the play are being filmed by a documentary crew in places around the prison, with the actors in their prison clothes, to drive the parallels home. As ambitious as it may be, “The Life of Jesus Christ” is not an entirely surprising project at Mr. Cain’s Angola. As Louisiana’s sentencing laws have grown ever stricter, Angola has become less of a way station and more of a terminal; 16 years ago, the average sentence length here was half of what it is now. To combat hopelessness, a problem both moral and practical, Mr. Cain has advocated a sentencing overhaul and has added programs at the prison like a TV station, a Baptist seminary and a hospice with inmate helpers. He has also developed a reputation for dealing strictly with anyone who questions his rules — actors who violated regulations recently were “locked up” and missed the show — and a belief in moral redemption that often has a distinctly Christian cast. A few inmates have sued, alleging religious discrimination. “This is another example of the pervasive Christian environment at Angola, funded and supported by outsiders,” Marjorie R. Esman, director of the American Civil Liberties Union of Louisiana, wrote in an e-mail. “The A.C.L.U. hopes that religious plays will not be the only ones that inmates perform for the public.” But in the context of a place like Angola, these are complicated matters. Wilbert Rideau, an award-winning journalist who spent 40 years at Angola, often tangled with Mr. Cain, even calling him a dictator and a bully in his book, “In the Place of Justice.” But having seen how few opportunities prisoners are allowed to have elsewhere, Mr. Rideau said he had grown less concerned about Mr. Cain’s motives. The production was not Mr. Cain’s idea. Cathy Fontenot, an assistant warden, was in Scotland several years ago and heard about a passion play, written by an Englishman named Peter Huntley, that was performed on the lush grounds of Dundas Castle. The grounds reminded her of Angola. She reached out to the owner of the castle, Sir Jack Stewart-Clark, and he supported bringing the play over (he also attended the performances). Prison officials emphasize that involvement is voluntary and that the production was funded with donations from individuals and charitable groups. Ms. Fontenot also says that “The Life of Jesus Christ” is not pushing a particular religious message but a general one of moral redemption, though that sentiment is not echoed by some actors and donors, who speak of saving lost souls. But in any case, the actors bring their own meanings. “I’m here for embezzlement,” said Patricia Williams, 51, a slight, soft-spoken woman who plays the older Mary. A lot of the other inmates ask her how she manages to make herself cry as she cradles and caresses the limp body of Bobby Wallace, who plays Jesus. She tells them she thinks about her son who is a Marine, and the nightmare that he might come home in a body bag. How many tours has her son done, she was asked. “I don’t know,” she said, quietly. Soon after that scene, Mr. Wallace is carried offstage, and minutes later, of course, returns and tells the disciples that they are to forgive and will in turn be forgiven for their sins. The music swells and the audience claps. Soon after, the men would change back into their prison clothes, Ms. Williams and the other women would be handcuffed and led onto the van back to St. Gabriel, and, much later that night, after a long day of staging the life of Jesus Christ, Mr. Tyler would return once again to his lower bunk. Copyright 2012 The New York Times Company. Reprinted from The New York Times, National, of Sunday, May 6, 2012.